This pipe organ is such a wonderful addition to our music ministry, and we are all excited about the ways it has already begun to enhance our worship. Cornel Zimmer Organ Builders has done an outstanding job restoring and creating a versatile and complete instrument from quite a diverse collection of historic pipework. In many respects, the organ reflects the nature of this congregation. People come to this community from all over the country, from numerous denominational and various faith backgrounds. Rather than trying to conform to a particular creed or list of beliefs, and instead of spending time arguing about those differences, the people of this church simply start doing things – together – good things, like building habitat houses, working in multiple ministries to the poor or our child advocacy center, and being the body of Christ to each other and to our community. I think all of that starts with worship, and our music each week is one of the unifying factors of the worship of our congregation. Cornel Zimmer Organ Builders has done the same with this pipework, finding ways to maintain the individual character of the sounds while shaping them to work together to create something more beautiful and effective. 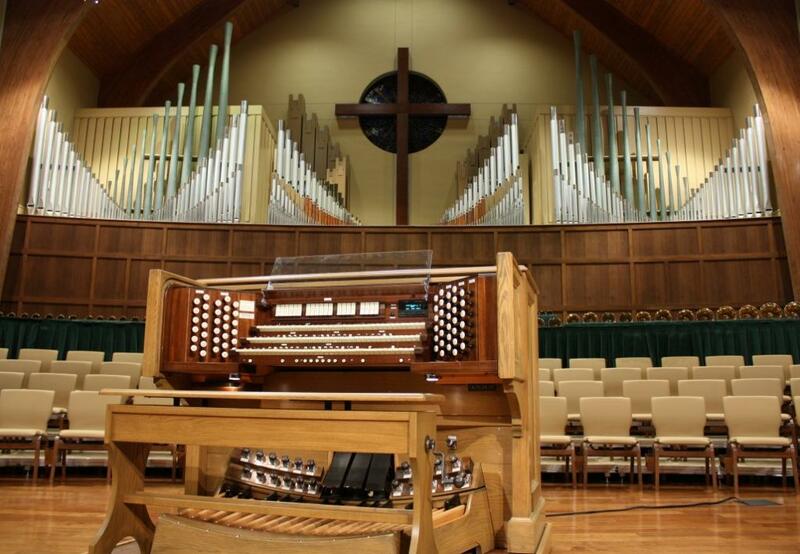 The organ project of the Community Church at Tellico Village (Loudon, TN) began, as many projects do, with a group of members who envisioned the day when their church could replace their digital organ with an authentic pipe organ. In 2003, the church began a serious effort to provide additional space for a growing membership and space for a new pipe organ. Soon, this informal group received the blessing of the Church Council to become the Ad Hoc Pipe Organ Committee attached to the Music Committee. After investigating several organ companies and types of organs, Brad Rule of B. Rule & Co. suggested that we purchase an 1862 Henry Erben organ that was rescued from a church in Brooklyn, NY, by the Organ Historical Society. By the fall of 2003, we did acquire the Erben from the Organ Clearing House and transported it from their New Hampshire warehouse to a storage facility in Tellico Village. Our intention was to purchase not only a historically interesting organ but one also that would provide a pipe organ costing significantly less than an organ using all new components. Henry Erben was considered one of the most eminent organ builders of the nineteenth century. Additionally, the Committee noted that Erben was a key participant in the mid to late 19thCentury “Golden Age” of American pipe organ building. He adhered to classical principles that included significant ensembles of eight foot stops, gentle voicing and low wind pressures producing a tone which is bright, free-sounding, and decidedly unforced. As happens with church projects, the expansion plans were delayed for about six years. The good news is that, instead of expanding our current sanctuary with many potential drawbacks such as inefficient physical design and undesirable acoustics, it was decided to build a completely new sanctuary that would seat over 800 members. 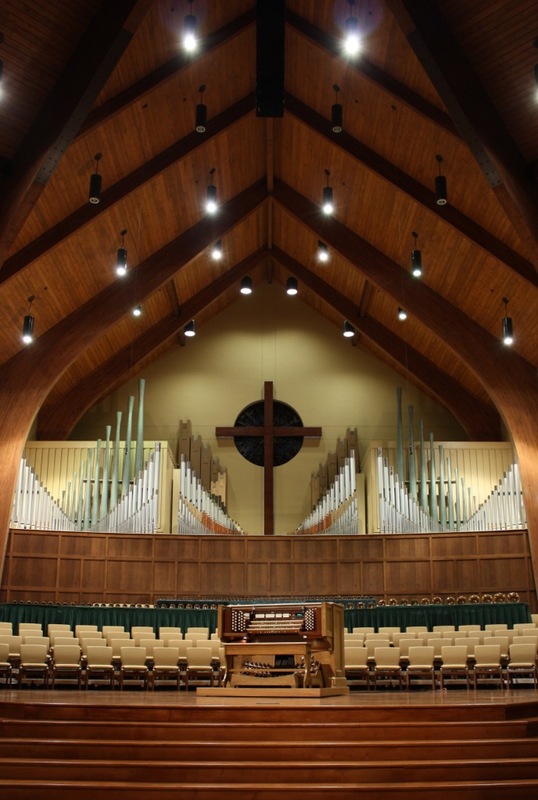 We carefully designed the new sanctuary to provide the best possible space and location for the organ. This front and center location facing the longest axis of the room, not only provides good sound projection for church members and accompaniment for our vocal and handbell choirs, but also adds a traditional church-like focal point for members sitting in the congregation. The floor of the organ platform is constructed of concrete and the walls of concrete block with a solid finish of old-fashioned smooth plaster. Of course, after six years, the original Pipe Organ Committee added new members to form the Musical Instrumentation Team. This team visited with and interviewed several organ builders and finally selected Cornel Zimmer Organ Builders of Denver, NC. Cornel Zimmer Organ Builders was very much interested in our project and the use of the 1862 Henry Erben as the centerpiece for an organ substantial enough to meet the needs of our fairly large worship space and our somewhat frugal budget. In every respect, they met and many times exceeded our expectations. 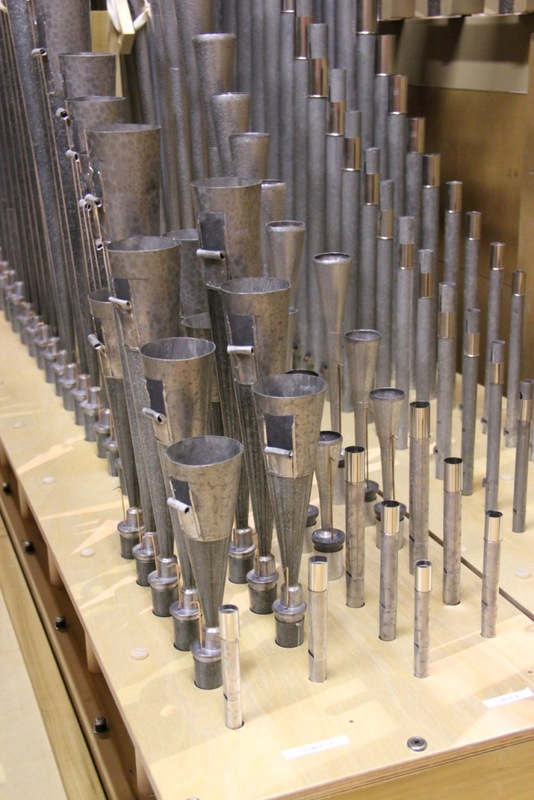 Not only did they embrace the uniqueness of our Erben pipes, but they also provided other appropriate, and in some cases historically interesting, stops from a variety of used organs to create an organ that is a joy to hear and that meets the needs of our significant music ministry. This assemblage of pipes, with various backgrounds working together to form a unified voice, mirrors one of the most basic concepts of our Community Church. During the summer of 2008 Cornel Zimmer Organ Builders was approached by the Musical Instrumentation Team of Tellico Village Community Church. The team had been formed for the purpose of choosing an instrument for their new sanctuary, which was still in the design stages. The team presented us with several criteria and asked for our recommendation. Our resulting dialog introduced us to an enthusiastic group of individuals committed to having the best possible instrument for their new worship space. Their enthusiasm was immediately contagious and the potential for an exceptional instrument in a fine room became clear. The committee had previously purchased the pipework and some internal components from an 1862 instrument by Henry Erben. The pipework had been in storage near the church since 2003 and the committee was hopeful that some or all of the pipework could be incorporated into a new instrument. We were intrigued by the possibility of working with pipework from this era and, with the help of fifteen volunteers, took a survey of all of the pipework in storage. The instrument, having been removed by Organ Clearing House, was well packed and all was pipework intact. We felt confident that the pipework could be successfully restored and would play a significant role in a new instrument. Of the twenty-six ranks of Erben pipework twenty proved suitable for use in a new instrument. 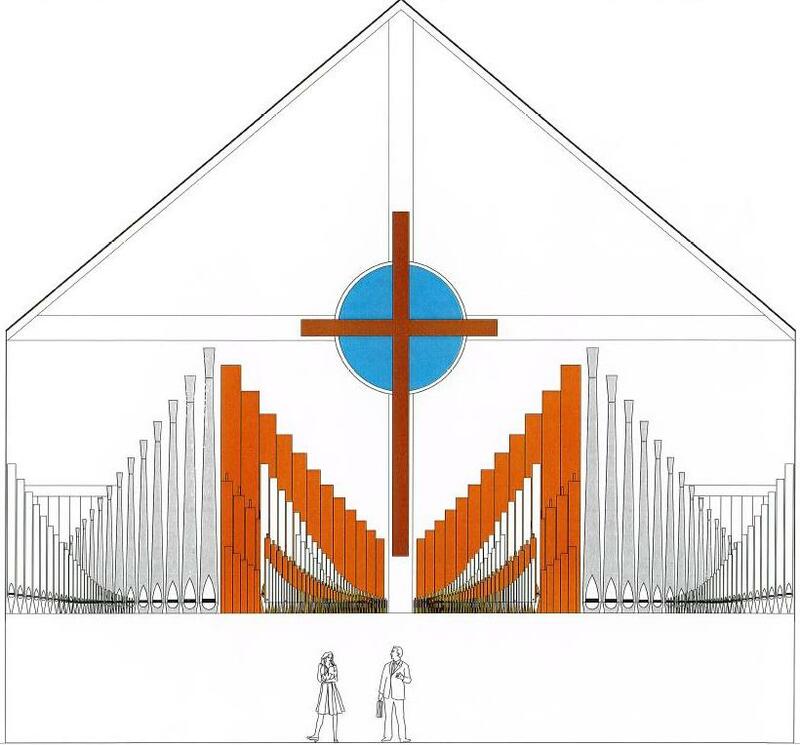 When we were chosen to build the instrument during the design phase of the new sanctuary, we were able to work closely with the architects to plan a space for the organ that would allow maximum tonal egress and ensure easy access for maintenance and tuning stability. The resulting collaboration between all parties gave the organ prime placement, speaking directly down the axis of the nave. The walls behind and around the organ are either solid concrete or double layered gypsum board, which allows for exceptional clarity and projection to the organ. The new sanctuary can comfortably seat more than 850 and can accommodate more than 1000 when filled to capacity. It was clear that the twenty Erben ranks would need to be augmented to fill such a large space and while space was not a limiting factor, budget was. A final specification of 42 ranks was designed, leaving room for future growth. To complement the existing pipework we built nine new ranks and carefully selected ranks from two other instruments, an early 1900’s Haskell instrument and a 1929 Austin, for inclusion in the instrument. We carefully cleaned and restored all of the existing pipework. Many of the flue ranks had several coats of paint and shellac that needed to be removed. We used a cleaning solution with a butyl de-greaser to strip the pipes down to the bare metal and either applied a clear coat of lacquer where needed or painted the pipes that would be displayed in the façade silver. We repaired and oiled wooden pipes and painted the largest Subbass 16’ and Open Wood 16’ pipes in various shades to accent the pipes. All reed pipes received a complete restoration by Greg Caldwell of Organ Reed Restoration in St. Louis, Missouri. On an overcast day in late October of 2010, an 18-wheeler loaded with eleven tons of organ set off from our shop in Denver, NC in route to Loudon, TN. Our crew arrived at the same time as the tractor trailer and was greeted by more than fifty cheering church members, ready to help unload. Young and old joined in the procession of parts and pipes, and the entire truck was unloaded in only a matter of hours. Working around a busy schedule of construction still being completed in the sanctuary, we completed the physical installation of the organ in December, and tonal finishing began in early January. The organ was first used in worship on February 6th. Our tonal approach on the Tellico organ was to maintain the original voicing of the principal and flute choruses in the 1860 Henry Erben pipework. After thorough cleaning and just a few repairs, we found that the flue pipes responded well on 3” wind pressure. Principal and flute stops alike speak smoothly with clear articulation at a moderate volume level. The Great division boasts a complete principal chorus from 16’ pitch through the 1 1/3’ Mixture IV. The Swell also contains a complete principal chorus based on the 8’ Diapason and the Choir has a chorus through 2’. One unique Erben stop, which was quite challenging but a favorite of the Tellico organ committee, is the Bell Gamba that is playable at 16’ and 8’. It takes a prominent place in the visual aspect of the pipe layout and tonally provides a unique string timbre that works well alone or in combination with other stops. To complete the specification, we carefully selected a number of reed and string stops to blend with the tonal character of the predominant Erben choruses. The Swell Viola and Viola Celeste are voiced on 5” as are the Oboe 8’ and Trumpet 8’. To give added weight to this division, both the Viola and Oboe are extended to 16’, the resonators of the Petite Bombarde 16’ being full-length. The Open Wood, Subbass and Trombone 16’ also speak on 5” of wind. The Pedal Trombone 16’ is 7” scale and is extended to 73 notes, allowing it to be played in the manuals. To further enhance the flexibility of this stop, it was made into a floating “division” allowing the stop to be played at multiple pitches on all manuals. The Choir reeds are voiced on 3” and include the 8’ Clarinet, the only Erben reed that could be retained. It’s somewhat edgy character gives it excellent carrying power and it blends well with the Choir principals or flute stops to take on many different colors and uses. The overall pitch of the Erben pipework was about one quarter step sharp of today’s standard pitch. The Erben scales are moderate, compared to today’s trends, and the cubic volume of the new sanctuary is quite large. Therefore, we decided to rescale most of the stops up one note to achieve the tuning capability for a pitch standard of A=440. All pipework is placed on one level to promote tuning stability. To work within the budget of the church we decided to build electric action chests. Our preference, however, is to build pneumatic chests, and we were concerned that placing the pipes directly on electric action would result in difficulties with pipe speech. Our solution was to place all pipework on channeled electric action to help alleviate any unwanted effects on pipe speech. Larger bass pipes and the pipes of the 16’ Trombone are on pneumatic action. This choice of action allowed for judicious borrowing of stops between divisions and some extensions to enhance the flexibility and versatility of the instrument. For added power in the Pedal division, we also chose to include a 32’ resultant. After hearing a successful example of a “smart” resultant on the Fisk organ at St. Peter’s in Charlotte, NC, we asked Peterson to program the resultant to quint the 16’ Subbass when it is drawn, but to then quint the Open Wood 16’ when it is drawn. The results are quite literally earth-shaking! From a subtle purr under strings to a throaty rumble under full organ, this use of technology has proven remarkably successful. Wind for the instrument is provided by a 3 HP Spencer blower and is regulated by reservoirs using both springs and weights to assure a steady wind supply. Solid wood and metal windlines ensure ample wind even under the greatest demands. A Peterson ICS-4000 systems controls both the console and pipe-drivers. A respected friend and colleague in the business expressed some concern after hearing our plans for the instrument, wondering if a seemingly disparate collection of pipes could become a cohesive whole. One could easily understand his concern, but through careful selection of pipework and special attention to the scaling and regulation of each stop, the finished organ is indeed a cohesive instrument capable of great power, encouraging the congregation to sing while enveloping, but not overwhelming them, with sound. Effective swell enclosures allow the softest stops on the organ to speak at a delicate pianissimo and give the organist the ability to create a seamless crescendo. A complete array of couplers and a wealth of color and solo stops give the organist a broad palette with which to “orchestrate” works of many different genres. Special thanks must be given to ministers, staff and members of the Tellico Village Community Church who had the vision to undertake both a large-scale building project and a substantial organ project. It has been a pleasure to be a part of this exciting project and to work with such an enthusiastic group. As many of the pipes in the organ reach their 150th anniversary, it is our hope that these pipes will speak for many more generations to come.